There are only four matches remaining in the 2014 World Cup with the semifinals being played this Tuesday and Wednesday July 8 and 9. 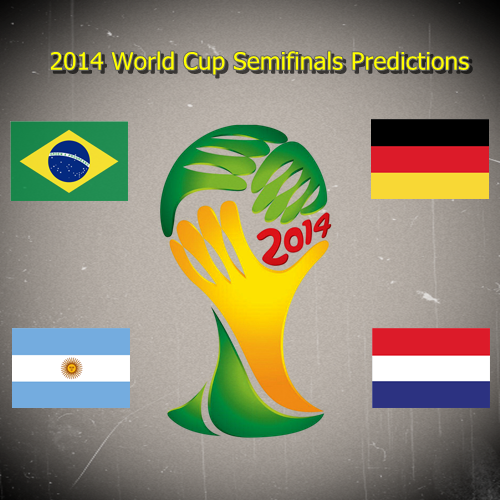 The semifinals feature historical match-ups between Brazil v Germany and Argentina v Netherlands. I’ll admit that I didn’t fare so well in my quarterfinals predictions in getting just two out of the matches right. I did think that Colombia and France were going to be the better teams, but Colombia were undone by some dodgy refereeing coupled with a very aggressive Brazilian team while France were undone by their own lack of ingenuity and mental preparedness. The semi-final matches feature four teams that have all played in the final as well as both match-ups having been a World Cup final match in the past. There is also the potential to set up previous World Cup Final match-ups. This has made for some interesting narrative and some exciting prospects in terms of match drama. Expect some good matches, if low scoring.